Camden Fisher arrives at boarding school haunted by a falling-out with her best friend back home. But the manicured grounds of Lethe Academy are like nothing Cam has ever known. There are gorgeous, preppy boys wielding tennis rackets, and circles of girls with secrets to spare. Only . . . something is not quite right. One of Cam's new friends mysteriously disappears, but the teachers don't seem too concerned. Cam wakes up to strangers in her room, who then melt into the night. She is suddenly plagued by odd memories, and senses there might be something dark and terrible brewing. But what? The answer will leave Cam—and readers—stunned and breathless, in this thrilling debut novel. This review is FULL of spoilers: please only read if you want to see spoilers. Ok, I am not going to leave you hanging like that. The Last Academy was good, but not great. I spent a majority of the book thinking to myself, "I have no idea what is going on." The author was very close lipped about hints and clues in this book (other than a few, but I had no idea how they fit into the story). I feel a bit that it was too close lipped. The ending and "reveal" came so suddenly and so close to the end- I felt like it was really rushed. That was the real problem with this story- it was incredibly unbalanced. Too much time was spent on before the big reveal and not enough in the aftermath. The first 3/4 of the book dragged and the last 1/4 went too fast. The more I think about this book, the more I dislike it- which makes me very sad. I love the mythology that it is based around, but some of the storylines are downright disturbing. I wish that Mark's story could have been different. I am not sure if it is because I have babies, but I am really rubbed the wrong way by a baby haunting his mother for 18 years, and growing up in the process. It just seems incredibly wrong to even write about it. I think that was the point in the story that really bothered me- I mean really (so much I almost put the book down). I wish there would have been some sort of warning that this was a ghost story. I typically really really don't like ghost stories (so I suppose not finding out that it was one until near the end was better; I probably would have DNF'ed it earlier if I had known. 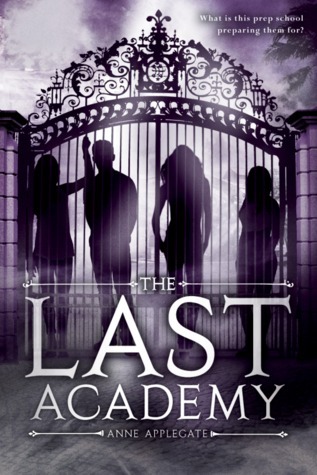 The Last Academy was a decent mystery/ paranormal read. With a disjointed plot, unremarkable characters, and some seriously disturbing storylines, it is not a book I will revisit. Want to read a few reviews of people who liked it more than me?